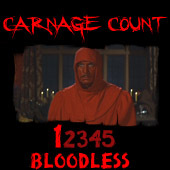 "I dialed the wrong number..."
After his short story “The Word Processor of the Gods” was adapted during the show’s first season, Stephen King trekked to the Darkside himself a few years later with a brand new tale in “Sorry, Right Number.” Like “Word Processor,” this episode took its cue less from the EC-style ghoulishness, turning its eye instead towards the existential dread of the Twilight Zone. The result is a haunting little tale, albeit in ways you don’t typically associate with this show, which often aimed for thrills and chills in lieu of genuine soul-shaking. For a moment, this episode does hinge on what appears to be a fun, inviting hook: as busy housewife Katie Weiderman (Barbara Weetman) chats away on the phone, a her call is interrupted by another call. A frantic voice on the other side delivers a cryptic warning, stumping Katie, who assumes it’s her daughter, elderly mother, or her sister. When the first two are immediately ruled out by phone calls, Katie is left wondering who it could have been: deep down, all she knows is it’s surely one of her family members. Something in her bones just tells her it’s so, even though her husband Bill (Darrin Stevens)—an author enduring a hellacious bout of writer’s block—insists she’s the victim of a prank call. A visit to her sister’s house confirms that she, too, is alright and fell asleep with the phone off the hook. Satisfied but still somewhat shaken, Katie returns home only to meet with tragedy the following night, a development that puts her on a path to eventually deciphering the meaning of that mysterious phone call. A potent blend of a couple of my favorite Twilight Zone episodes (“Night Call” and “Spur of the Moment"), “Sorry, Right Number” unnerves because it’s so utterly human. A mysterious, supernatural event drives the plot, but it’s only a conduit for Katie’s realization about a life so hurried and chaotic that she doesn’t stop to appreciate what she has until it’s too late. And when granted a second chance, she’s left fumbling, essentially trapping herself in a horrific, existential loop of regret and sorrow for the rest of her days. Weetman’s performance here is disarming in some respects: initially, it feels a bit broad and melodramatic in that very specific sitcom sort of way before she taps into depths of a profound mixture of guilt and terror. The pangs of despondency that slowly but perceptibly hang on her face as she realizes the truth about that mysterious phone call are utterly haunting in how they remind us to cherish what we have, lest we allow it to slip away. Again, that’s not what you usually look for in Tales from The Darkside, a series that more routinely delivered up fiendish, macabre episodes than it did melancholy ones. 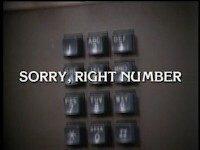 And yet, “Sorry, Right Number” is a reminder of not only the show’s versatility but King’s as well: between this and “Word Processor,” the author’s contributions captured both poles of the emotional spectrum, offering up a haunting, melancholy tale and a weirdly optimistic one, respectively. Of the two, this one is my favorite since it feels so much like a Twilight Zone episode. All that’s really missing is a Rod Serling narration to bookend it—though I have to admit that Paul Sparer’s ominous voiceover warning that “the dark side is always there” is a fine substitute.